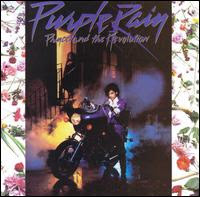 Purple Rain kicked down the door of the world in 1984, which was right around the time that I started to become really interested in popular music. I don't really remember listening to the radio when I was kid without the possibility of Prince coming on. I vaguely recall taping (with a tape recorder held up to my parents' stereo) "Let's Go Crazy," so I could listen to it over and over. Prince was a struggle for my mom. She seemed to like the music, but once she caught a glimpse of the naked little guy crawling out of the bathtub, dripping wet and on all fours, in the "When Doves Cry" video, she began to have some serious reservations about me listening to his music. I wasn't allowed to own a copy of the record, but in 1984, Prince was inescapable. Everybody else had the album, and if I ever had a chance to catch a glimpse of MTV (we didn't have it at our house), he was almost guaranteed to be on. And since over half the songs on this record were getting radio play ("Computer Blue," "Darling Nikki," and "The Beautiful Ones" were the only ones that weren't - though I guess "Baby I'm a Star" was never officially released as a single), it wasn't hard to at least hear Prince. I think my mom just didn't want me looking at him. I remember hearing that at this time, Prince was the first artist to have the number one song, album, and film, all in the same week. Not sure if that's true, but even if it isn't, there's really no denying that this record ruled the summer and fall of 1984. It was just immense. And rightfully so. This record almost plays like a greatest hits album. Even those songs I just mentioned that weren't getting radio play were incredible. It's just that the other songs were so unbelievably good that they forced the merely great ones into the backseat. You know all of these songs, so I won't bother to say too much about them. But talk about an album where everyone could find something to love. Parents dug it, and Prince still remained mysterious enough so the kids found him infatuating. And just to put it all in perspective, Prince had just turned 26 when this LP was released. And what have you done with your life?